This article examines 10-year to 15-year survivals from arterial bypass grafts using arterial vs saphenous venous grafts. Locker C, Schaff HV, Dearani JA, Joyce LD, Park SJ, et al. Circulation. 2012 Aug 28;126(9):1023-30. PMID: 22811577 http://dx.doi.org/10.1161/CIRCULATIONAHA.111.084624. Epub 2012 Jul 18. Review. Coronary artery bypass surgery (CABG) , is performed to relieve angina and reduce the risk of death from coronary artery disease. 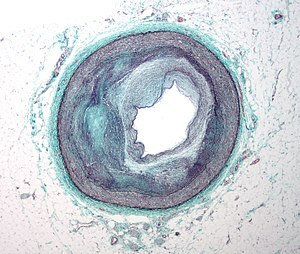 Arteries or veins from elsewhere in the patient’s body are grafted to the coronary arteries to bypass atherosclerotic narrowings and improve the blood supply to the coronary circulation supplying the myocardium. 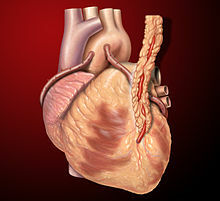 This surgery is usually performed with the heart stopped, necessitating the usage of cardiopulmonary bypass; techniques are available to perform CABG on a beating heart, so-called “off-pump” surgery. Russian cardiac surgeon, Dr. Vasilii Kolesov, performed the first successful internal mammary artery–coronary artery anastomosis in 1964. Using a standard suture technique in 1964, and over the next five years he performed 33 sutured and mechanically stapled anastomoses in St. Petersburg, Russia. Dr. René Favaloro, an Argentine surgeon, achieved a physiologic approach in the surgical management of coronary artery disease—the bypass grafting procedure—at the Cleveland Clinic in May 1967. His new technique used a saphenous vein autograft to replace a stenotic segment of the right coronary artery, and he later successfully used the saphenous vein as a bypassing channel, which has become the typical bypass graft technique we know today; in the U.S., this vessel is typically harvested endoscopically, using a technique known as endoscopic vessel harvesting (EVH). Soon Dr. Dudley Johnson extended the bypass to include left coronary arterial systems. 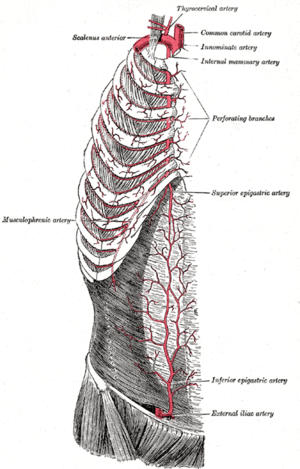 In 1968, Doctors Charles Bailey, Teruo Hirose and George Green used the internal mammary artery instead of the saphenous vein for the grafting. intramyocardial (the coronary artery is located within the heart muscle rather than on the surface of the heart). Similarly, a person with a single stenosis (“narrowing”) of the left main coronary artery requires only two bypasses (to the LAD and the LCX). 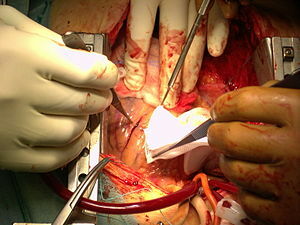 However, a left main lesion places a person at the highest risk for death from a cardiac cause. Both PCI and CABG are more effective than medical management at relieving symptoms, (e.g. angina, dyspnea, fatigue). 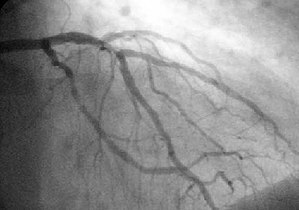 CABG is superior to PCI for some patients with multivessel CAD. The Surgery or Stent (SoS) trial was a randomized controlled trial that compared CABG to PCI with bare-metal stents. The SoS trial demonstrated CABG is superior to PCI in multivessel coronary disease. rates of major adverse cardiac or cerebrovascular events at 12 months were significantly higher in the DES group (17.8% versus 12.4% for CABG; P=0.002). higher need for repeat revascularization procedures in the PCI group with no difference in repeat infarctions or survival. Higher rates of strokes were seen in the CABG group. Ann R Coll Surg Engl 2008; 85(4):367-69. Over the last two decades, many studies have shown better long-term patency rates and survival in patients undergoing coronary artery bypass grafting (CABG) with left internal mammary artery (LIMA) to the left anterior descending artery (LAD). Approximately 4% of all patients undergoing first-time CABG do not need a graft to the LAD. Of the rest, about 92% receive LIMA to LAD. LIMA usage was also reduced in patients undergoing combined CABG and valve procedures. METHODS : We reviewed 8622 Mayo Clinic patients who had isolated primary coronary artery bypass graft surgery for multivessel coronary artery disease from 1993 to 2009. Patients were stratified by number of arterial grafts into the LIMA plus saphenous veins (LIMA/SV) group (n=7435) or the MultArt group (n=1187). Propensity score analysis matched 1153 patients. RESULTS: Operative mortality was 0.8% (n=10) in the MultArt and 2.1% (n=154) in the LIMA/SV (P=0.005) group.This result was not statistically different (P=0.996) in multivariate analysis or the propensity-matched analysis (P=0.818). Late survival was greater for MultArt versus LIMA/SV (10- and 15-year survival rates were 84% and 71% versus 61% and 36%, respectively [P<0.001], in unmatched groups and 83% and 70% versus 80% and 60%, respectively [P=0.0025], in matched groups). The large difference between the MultiArt versus the LIMA/SV appears to be the 61% and 36% in unmatched and 80% and 60% in matched, evident at 15-years, favorable for the MultiArt group. bilateral internal mammary artery/radial artery (n=147) and LIMA/radial artery (n=169) had greater 10-year survival (84% and 78%; P<0.001) versus LIMA/SV. In multivariate analysis, MultArt grafts remained a strong independent predictor of survival (hazard ratio, 0.79; 95% confidence interval, 0.66-0.94; P=0.007). arterial grafting of the non-left anterior descending vessels conferred a survival advantage at 15 years compared with Saphenous Venous (SV) grafting. It is still unproven whether these results apply to higher-risk subgroups of patients. Reblogged this on Ember Branch.